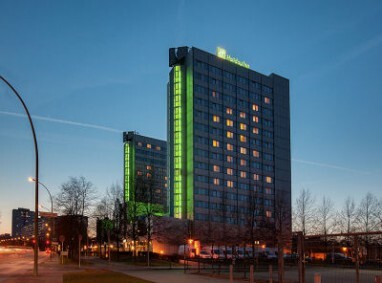 The Holiday Inn Hotel Berlin City East is just a few kilometres from Alexanderplatz in Berlin-Mitte with the Fernsehturm (TV Tower). Berlin´s fashionable districts of Mitte, Prenzlauer Berg, Friedrichshain and Kreuzberg are easy to reach from hotel by tram. 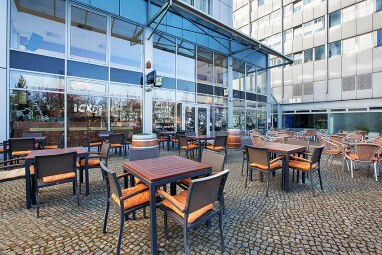 Holidaymakers, Berlin Visitors and families enjoy a spacious and friendly hotel to withdraw to after a busy sightseeing tour in Berlin. Athletes and fitness fans appreciate the hotel´s proximity to the Velodrom and the Sportforum Hohenschönhausen. 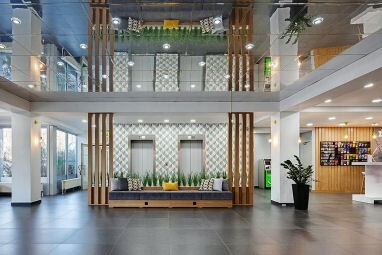 The modern 4-star Holiday Inn Hotel Berlin City East in the eastern part of Berlin provides spacious and light hotel rooms with air conditioning, all of them newly decorated in a fresh and clear design. 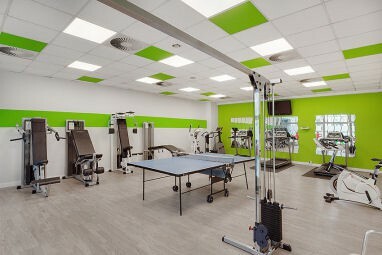 Guests of our Berlin hotel can benefit from a restaurant with local seasonal cuisine, a cosy lounge bar with cocktails, a fitness room with modern cardiovascular and strength training machines. The hotel´s spacious business rooms with free WiFi internet connection are ideal for business travellers. Corporate customers appreciate the location close to branches of Coca Cola and IKEA. 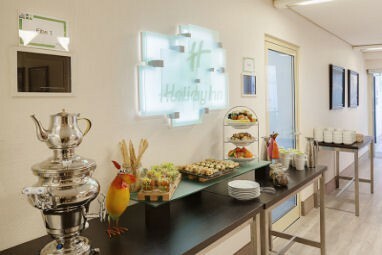 Our modern Holiday Inn Hotel Berlin City East is an ideal hotel for meetings, events and conferences: In hotel a redesigned Conference Centre with 11 light-bathed meeting rooms and modern technology provides the perfect backdrop for professional events in Berlin. We provide full-service, personal event management and modern conference technology as a matter of course. 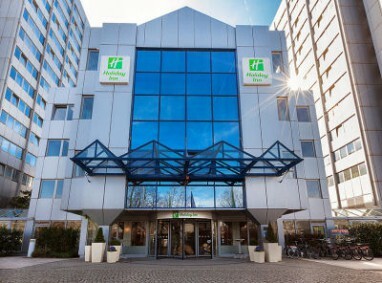 The Holiday Inn Hotel Berlin City East hotel provides 156 modern standard and business rooms. 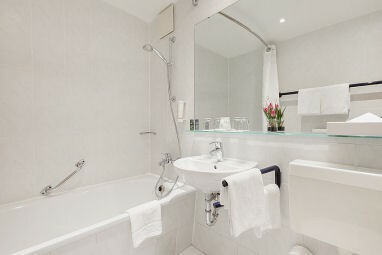 The light and friendly hotel rooms with 4-star comfort enjoy a clear and fresh design and have recently been redecorated. 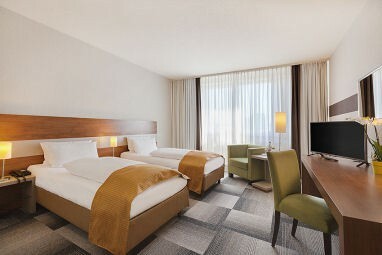 The rooms of our Berlin hotel are particularly spacious and provide our guests with a lot of space and room to develop. 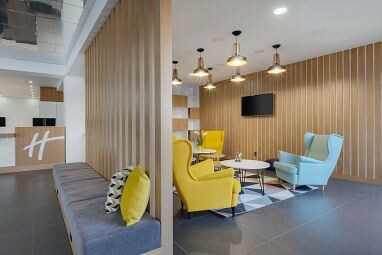 Business travellers in Berlin appreciate complimentary WiFi internet access in all hotel rooms and the top business services in the hotel´s Conference Centre. 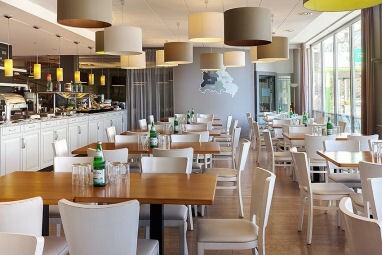 With restaurant ´´Grenzlos´´, the Holiday Inn Berlin City East hotel boasts a hotel restaurant with regional cuisine. The offering is rounded off by typical Berlin specialities such as home-made potato soup, Berlin style rissoles and Berlin style calf´s liver. These culinary delights are accompanied by a freshly-drawn beer and the warm service of our restaurant team. Guests can also take advantage of the outdoor terrace when the weather is good. 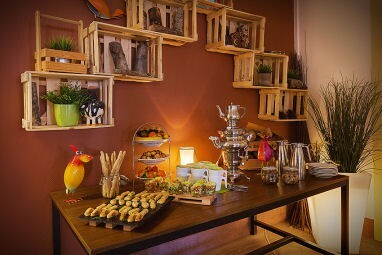 The Berliner Bistro of our hotel provides a snug atmosphere of traditional Berlin cosiness for your functions and events. We are happy to create unforgettable events for your birthdays, anniversaries and weddings. It is best to talk to our event team in person about whether to choose a real Berlin evening with ´´currywurst´´, rissoles and Berlin-style calf´s liver, or a Mediterranean four-course meal. Are you planning an event in Berlin? Then talk to us! We would be happy to give you a customised quote! 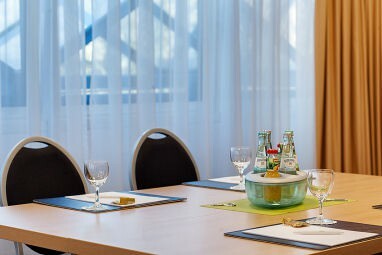 The function area of the hotel offers an optimal environment for meetings and conferences with its 10 naturally lit rooms and latest technology. Your events become full service experiences, with our meeting packages specially organized to meet your requirements. Take A 115 towards the city centre and drive to the exit Kaiserdamm, turn right into Kaiserdamm, drive on Bismarkstraße, then Straße des 17. Juni, continue past the Brandenburger Gate onto Unter den Linden. Now turn right into Mollstraße and go up to Landsberger Allee. The hotel is placed at the corner Landsberger Allee/Weißenseer Weg. Drive on the road Altlandsberger Chaussee towards Berlin, than follow Berliner Straße, Landsberger Chaussee and Landsberger Allee. The hotel is placed at the corner Landsberger Allee/Weißenseer Weg. Info Hotline: 030 / 31 80 445 105 (Mon-Fri 09:00 - 18:00). All rights reserved.